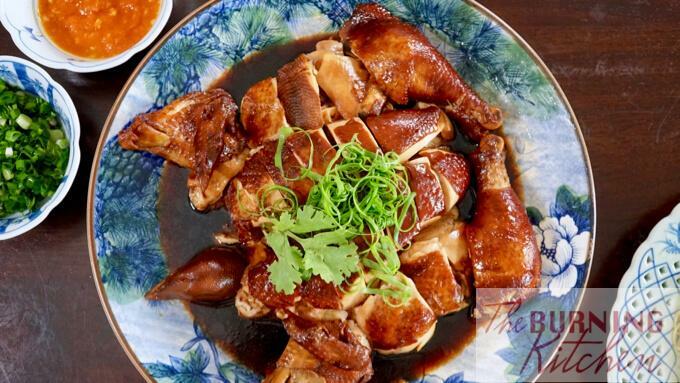 In 2016, Singapore’s Liao Fan Hong Kong Soya Sauce Chicken Rice & Noodle created a stir when it became world’s first Michelin starred hawker. 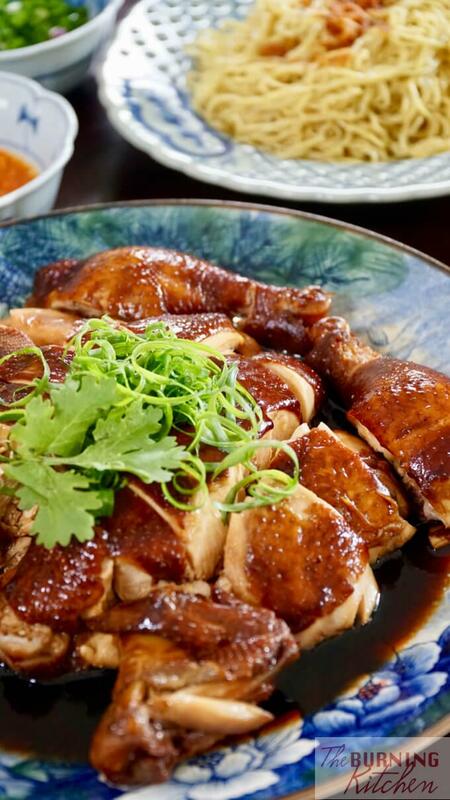 Often touted as the world’s cheapest Michelin starred meal, its signature Soya Sauce Chicken dish costs a mere $3. But before Liao Fan, there was Chew Kee – a 70 year old establishment still located at Upper Cross Street. 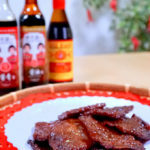 At one time, Chew Kee was the most famous soya sauce chicken stall in Singapore, so popular that several copy-cat stalls later sprung up and sparked off a soya sauce chicken war in the area. 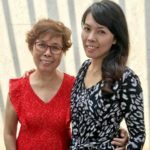 SO WHAT IS SOYA SAUCE CHICKEN? Unlike Hainanese chicken rice (the other famous chicken dish in Singapore), Soya Sauce Chicken (or Si Yau Kai in Cantonese) is a Hong Kong style chicken dish which is slow braised over low fire in an aromatic stew of spices and dark soy sauce. 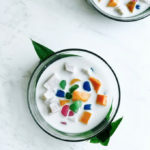 It is typically served with noodles or rice. Thanks to the slow braise, the chicken remains moist and ultra tender, while the skin is incredibly smooth and flavourful. 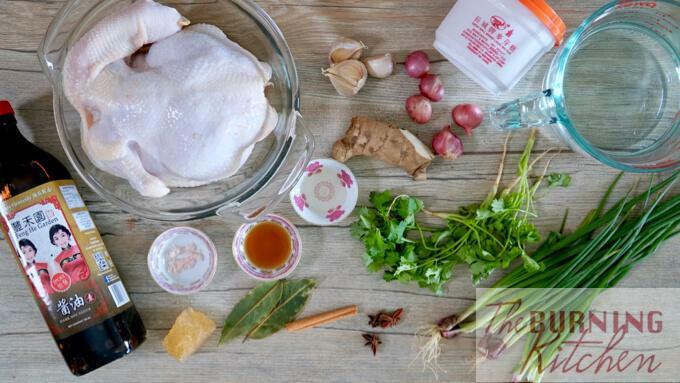 Remove the chicken innards and exfoliate the chicken skin with coarse salt. Rinse well and pat dry, then rub in the marinade ingredients all over and inside the cavity. 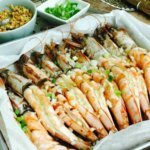 Leave to marinate for 30 minutes. Wash the spring onions. Remove the skin from the ginger and slice it thinly. Then peel the shallots and garlic, then bruise slightly with the blunt surface of your knife. 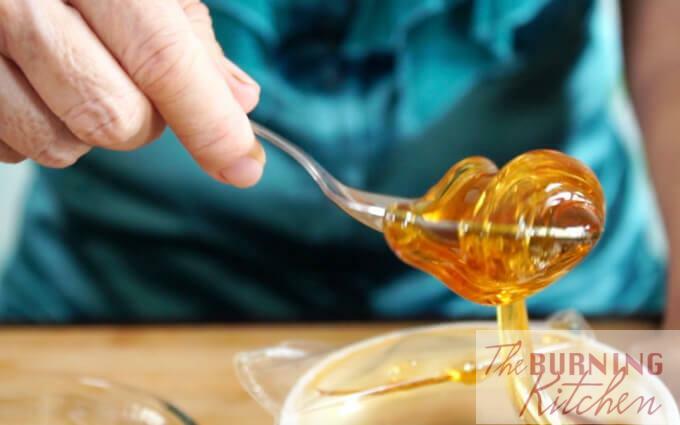 Add the glaze ingredients together to form a syrup for later use. In a small, deep pot, heat up 1 TBsp of oil over medium heat. Then add in the garlic, shallots, ginger, cinnamon stick, star anise and bay leaves and fry until aromatic. Next, add in the 1 litre of water, 1.5 cups of dark soy sauce, spring onion and rock sugar, and bring to a boil over high heat. Once boiling, hold the chicken by its neck, dunk it into the boiling mixture, then lift it back out. Repeat this dunking process three times. Watch the video for a clearer demo! 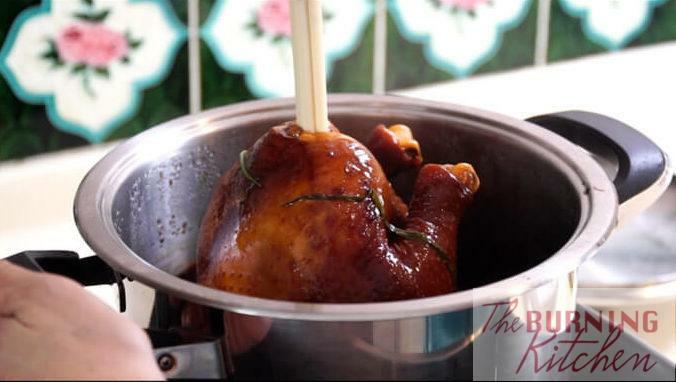 Finally place the whole chicken into the pot ensuring 3/4 of chicken is immersed in the soya sauce mixture. Cover the pot and cook the chicken over low fire for about 20 minutes, turning it every 10 minutes. Turn the heat up to high for 10 minutes to complete the cooking process. Remove from heat and allow the chicken to steep in the sauce for 15 minutes. Next, transfer to a plate and brush with maltose syrup followed by Chinese rice wine. Allow the chicken to cool, then chop it up and serve with rice or noodles. Use fresh chicken, not frozen, for this dish where possible – it will make a huge difference to the taste and texture of the dish. Use a tall pot that fits the width of the chicken as it requires less water to cover the chicken. 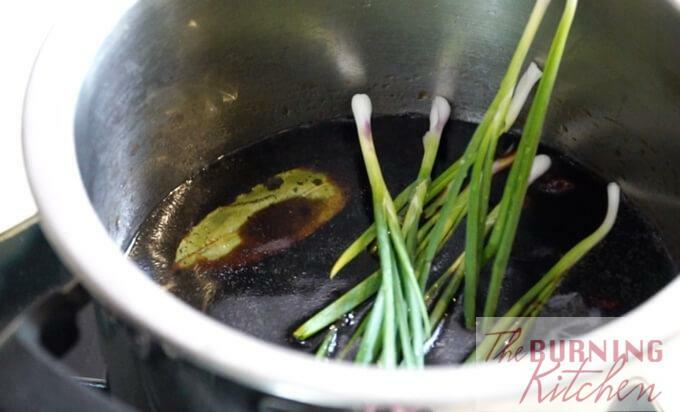 This way, the braising liquid will be more concentrated, resulting in a more flavourful dish. Clean the chicken by rubbing it with coarse salt to remove the yellow membrane on the chicken skin. This helps to get rid of the odour and gives the skin a smoother texture. 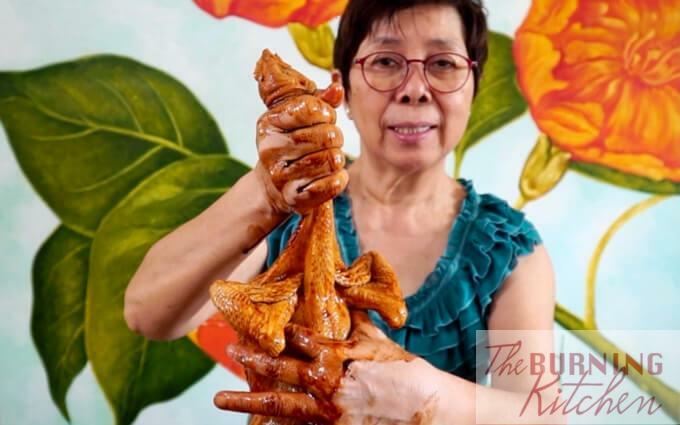 Fold the chicken wings backwards into a ‘arm-lock’ before cooking. This way you can remove the chicken from the pot with a pair of chopsticks, without breaking the skin. Watch how I do it in the video here. Dunking the chicken in hot water a few times helps to seal the juices nicely into the chicken due to rapid expansion and contraction of the skin. 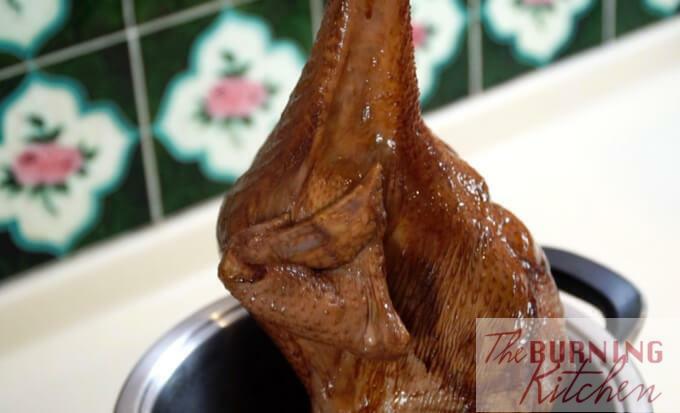 Leave the chicken head and neck intact as they provide a good grip for easy dunking. Test doneness by inserting a chopstick through the chicken thigh. If the juices run clear, the chicken is cooked through. Recycle the gravy. Do not discard the braising gravy. You can refrigerate it and recycle it a few times to braise chicken wings or chicken thighs for another meal. 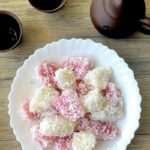 Substitute maltose with honey if you can’t or don’t want to purchase a whole tub. Taste the dark soy sauce first before adding it to the water. Some brands can be quite salty, so you will need to adjust the amount of sauce added accordingly. 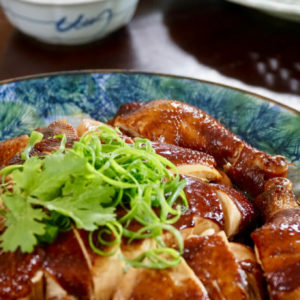 If you love Hainanese chicken rice, then you MUST try this equally delicious and easy-to-prepare Cantonese braised soya sauce chicken. Only 20 minutes active time to make! Remove the chicken innards, then exfoliate the skin and cavity with coarse salt. Rinse well and pat dry. Leave the chicken head intact. Rub the chicken all over with marinade ingredients and allow to marinate for 20-30 minutes. Remove the skin from the ginger and slice it thinly. 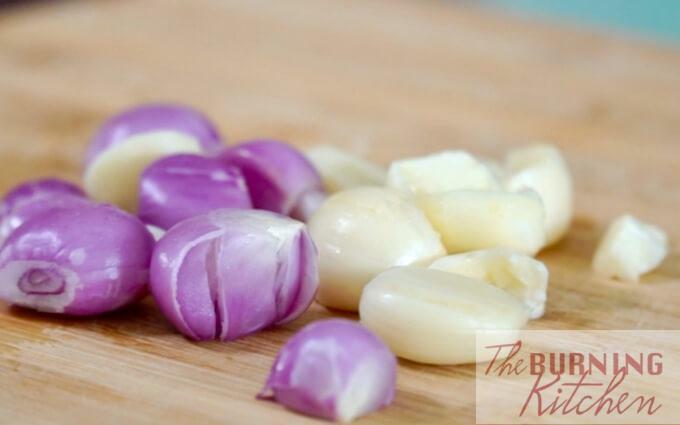 Remove the skin from the shallots and garlic, then bruise slightly with the blunt surface of your knife. 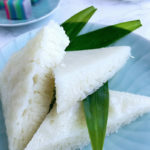 Wash the spring onions and set aside. In a deep medium-sized pot, heat up 1 TBsp of oil over medium heat. 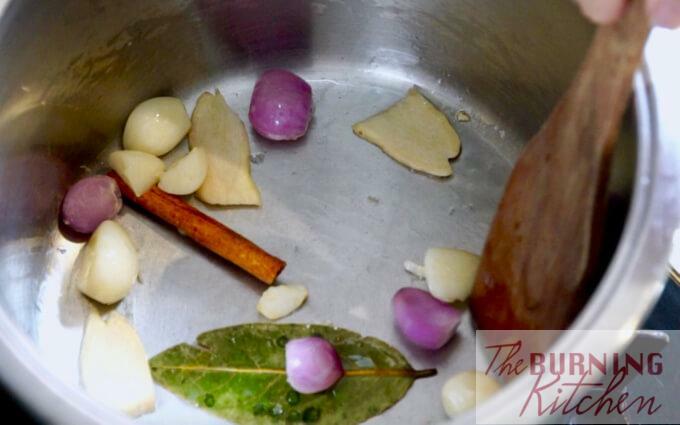 Then add in the garlic, shallots, ginger, cinnamon stick, star anise and bay leaves and fry until aromatic. Once boiling, hold the chicken by its neck and lower it into the sauce, then lift it back out. Repeat this process three times. Turn the heat up to high fire for 10 minutes to complete the cooking process. Check if the chicken is cooked through (see tips), then turn off the fire and allow the chicken to steep in the sauce for 15 minutes. Transfer the chicken to a plate and brush it all over with maltose syrup. Then brush it over with Chinese rice wine or Rose Rice Wine. Once the chicken is cool, chop it into pieces and serve with rice or noodles. 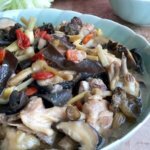 Use fresh chicken, not frozen, for this dish where possible - it will make a huge difference to the taste and texture of the dish. 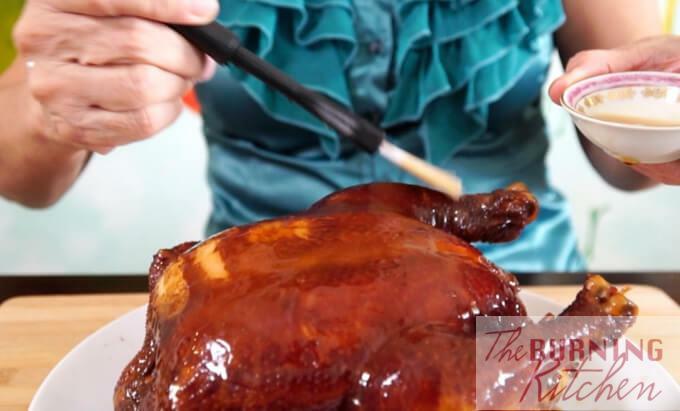 Use a tall pot that fits the width of the chicken as it requires less water to cover the chicken, making the braising liquid more concentrated. Rub the chicken all over and in the cavity with coarse salt. This removes dirt and the yellow membrane on the chicken skin, minimise the chicken odour and making the skin very smooth. 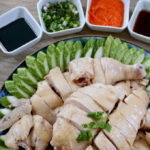 Twist the chicken wings into a 'arm-lock' before cooking, so you can lift the chicken out of the pot with chopsticks without breaking the skin. Dunk the chicken in the boiling water a few times to seal the juices into the chicken as the skin goes through rapid expansion and contraction. Retain the chicken head and neck as a handle for easy dunking. 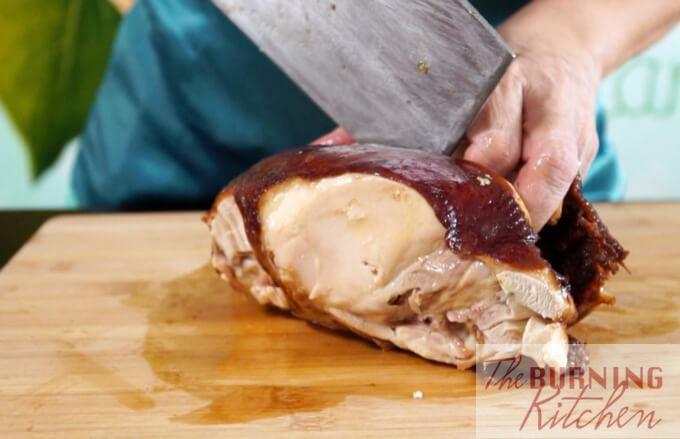 Test doneness by inserting a fork or chopstick through the chicken thigh to the bone. If the juices run clear, the chicken is cooked. Recycle the gravy. You can refrigerate it and recycle it a few times to braise chicken wings or chicken thighs for another meal. 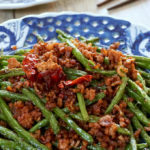 Taste the dark soy sauce first if you are using a different brand, so you can make the necessary adjustments. 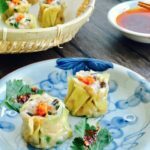 Sodium content can vary a lot across brands, and in general, Chinese sauces tend to become more salty the longer they have been kept.